Is it a bird? Is it a 'plane..? The habits of moths make them hard to spot. Small, dark and flying fast by night; this is not the world of a Large White butterfly flapping around your cabbage patch or a Peacock sunning itself on the buddleia. Most people encounter few moths. 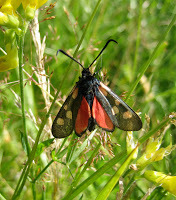 If they are lucky, their first conscious sightings will be of one of the day-flyers, maybe a silver Y or the conspicuous red and viridian Cinnabar or Burnet moths whose black and yellow caterpillars are one of the arguments for encouraging ragwort. More likely, you will meet your first moth on the window of a brightly-lit room after dusk on a warm summer night, or perched by an outside light, snoozing on a fence or your house's wall. And that is the point. Light is the great attractor of moths. To turn Biblical for a sentence: let there be light. You will read or be told of other trapping methods, notably rum-and-treacling which is a delightful process of mixing two very fine ingredients into a goo and smearing it on to the trunks of trees. Try it by all means but don't expect great results - and, following on from that, be cautious about over-enthusing children because that risks disappointment and disengagement with the hobby. No. Save up for a light trap or take part in communal light trapping. Hundreds and sometimes thousands of moths will come your way between April and September (and smaller numbers all the year round). The best light trap is the Robinson mercury vapour one. It is also expensive and has one significant drawback. It is very, very bright and as a result difficult to use in built-up areas. Difficult, not impossible. If you have nice neighbours and can screen them from any direct view of the bulb, you may be OK. The wider glow caused by the trap is much less obtrusive and might even be considered beautiful by some (ie including me). You can also get 'dark' mercury vapour bulbs which do not shine brightly at all but 'attract' (in inverted commas because no one is sure yet why moths come to light) on some other light frequency. I have never tried one of these but I know others who have, with good results. The second most effective trap is the Actinic which is much less bright. This makes it generally a bit less effective than MV but I know plenty of people who are more than happy with the outcome. On that score, it can be the case that you get too many moths in a trap at the height of the mothy year, between June and August. Surveying a trap with several hundred moths in it, when breakfast and the day's other duties call, can be a stressful experience even for placid souls such as myself. You light the lamp at dusk and turn it off in the morning. Most people fill the trap with eggboxes which the moths seem to consider the equivalent of cosy beds. Asking neighbours for eggboxes is also a good way of introducing them to your activities, involving them and reassuring them that you are not sinister or mad. I have become more and more interested in the huge range of eggboxes available in today's world and their pastel colouring and strange texture make an excellent backdrop when you are photographing moths. 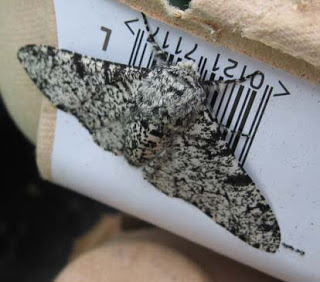 Some species, notably the black and white Peppered moth, make a habit of roosting on the - equally black-and-white - barcodes. Which brings me, in conclusion, to the need for another pricey bit of equipment: a digital camera to photograph your catch in the morning. Unlike butterflies, which may be obvious but are often jittery and watchful, most moths are in a deep sleep when you arrive to record them. I have often compared them to students after a night on the tiles. Photography is therefore easy-peasy but a good close-up focus is a huge bonus. Once you have finished taking pictures, move the trap as far away as possible from its original site and shake out the sleepers under bushes, in long grass or anywhere else which hides them from birds. I have always dealt with Watkins & Doncaster for my equipment, ever since I was nine and they sent me my first bottle of 'killing fluid' in those somewhat different, late 1950s days. Others have had good experience of Anglian Lepidopterist Supplies and you will doubtless find other firms - and boundless additional information about moth catching - online. Have you looked into red flashlights? Apparently insects cannot see red, and this makes it possible to watch insects at night without disturbing them. I do not have one yet, but my past experiences with normal flashlights suggest that this would be a good idea. 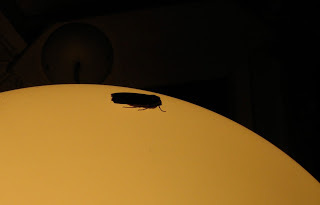 Personally, I would prefer red lights over lightbulb "traps" because they allow observation of fascinating natural behaviors, and do not cause light-pollution induced problems for moths (There is much research on this, and I have in fact found certain chafers apparently dying of exhaustion under lamps). 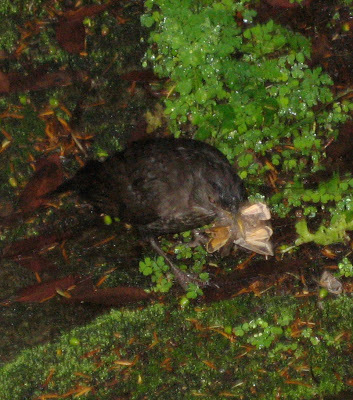 Also, this seems to be a very effective method of observation compared to food baiting, which I have tried myself. Hi Alex - how fascinating. I will definitely follow this up. I do have concerns about the effect of the trap on some moths - not many, as most seem happy to fly or creep away once disturbed, or even much later in the day if I leave them in the egboxes with the bowl partially upturned to deter birds. 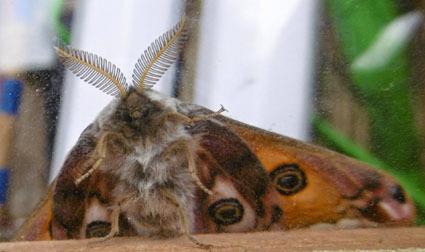 But a few seem to have done what appears to be the moth equivalent of fainting. Thanks very much for the info. Once I even saw a small moth flying in tight circles "under the influence".